Founder Alexander Edward opened Aultmore in 1897, during the peak of the Victorian whisky boom. After inheriting Benrinnes, Edward co-founded subsequently Aultmore and Craigellachie. The distillery was built to supply the blending houses. For years the whisky was called "Rarest of Speyside" and only locals knew where to ask for a "nip of the Buckie road". 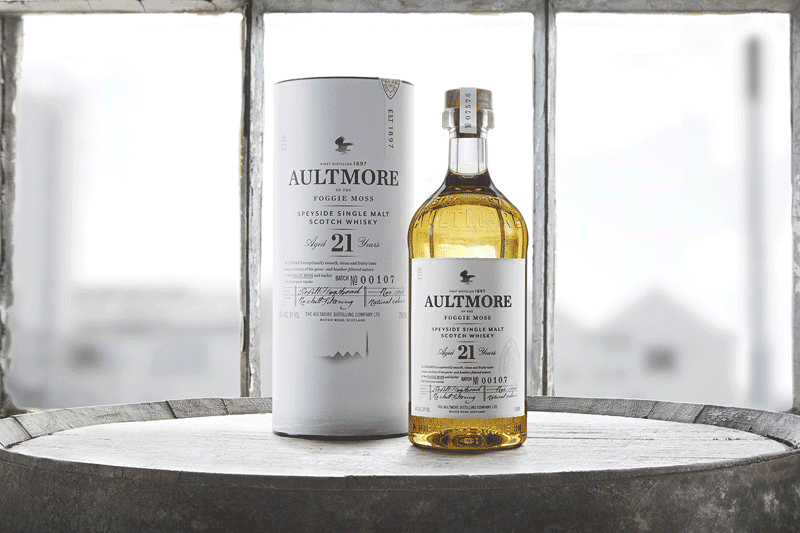 The 21-year-old single malt is a Travel Retail exclusive and can only be found in "duty-free" shops at airports. Although some specialised whisky shops laid their hands on some bottles and offer them too (but beware of their pricing strategy!). Let's see what Stephen Marshall and Bacardi discovered in the thick fog along Buckie Road. Colour: A nice golden colour, like a sweet white wine. The liquid leaves slow and thick legs on the glass. Nose: At first nosing, I had lots of paint, wood stain and glue. This dram needs some time in the glass (and maybe less in a plastic sample bottle). Olive oil infused with green herbs such as thyme, rosemary and sage. Orange marmalade with a slightly bitter touch. Some dusty notes from oak and wood shavings. His Royal Sweetness arrives a bit later with vanilla, honey and raisins. Pancakes, golden syrup and a subtle musky perfume. A few drops of water accentuate the honey and oak aromas. Orange marmalade and musk. 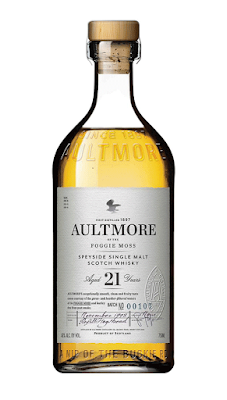 Taste: This Aultmore is sweet and powerful. Honey, apple, cinnamon and pepper. Peking duck and oranges. Truly warming with an oily mouthfeel. Water gives me again more wood notes, in a pleasant way. Creamy apple custard with vanilla and a splash of Calvados. Finish: Sweet and bitter in the aftertaste. Oak staves with a thin layer of honey. Traces of pepper and grappa linger in the mouth. 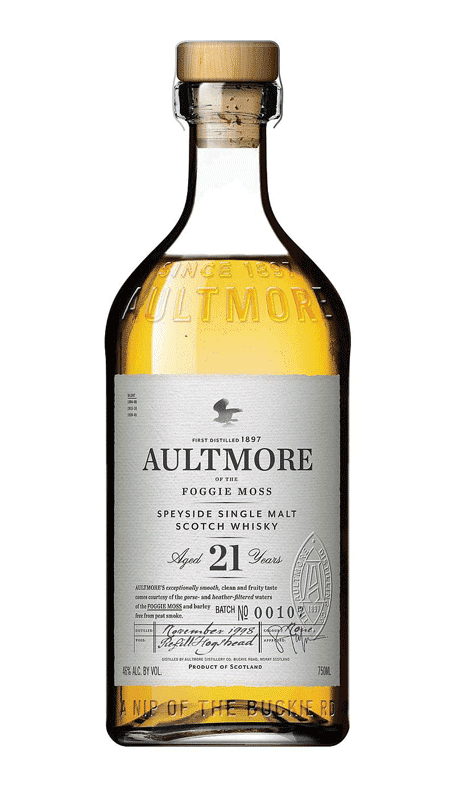 The Aultmore 21 was the best whisky from the three samples (12yo, 21yo and 25yo) I received from the PR company behind The Last Great Malts. Just like his younger brother, this single malt Scotch ticks all the right boxes and boasts a simply superb nose. 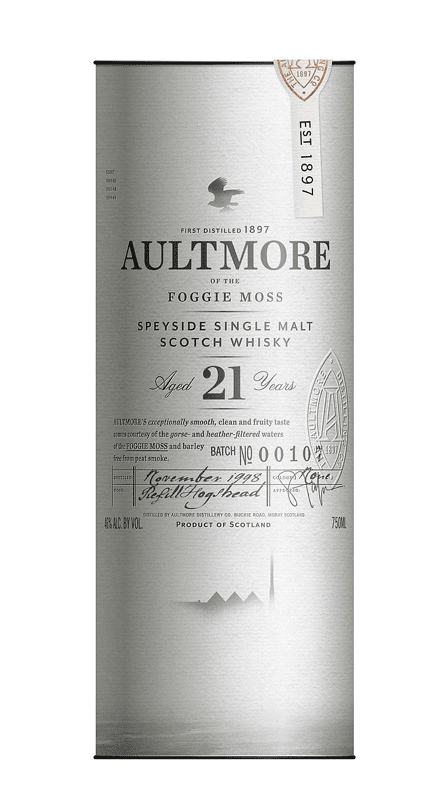 It has an excellent balance between the fruity Speyside character and the wood notes from 21 years in the cask. This whisky costs approximately £125 / €169 in airports and other travel retail areas. It's definitely aimed at the luxury segment of the market and will very likely seduce some travellers. A sample was provided by Sophie Donovan from Quercus Communications upon requesting a press release.